New to the BMW stable picked up my new 2018 XR yesterday. My first ride today and WOW what a bike! ! Last bike was a 2016 triumph tiger sport which was a great bike but this is a whole new level. Looking forward to enjoying this bike especially when it’s run in. Hello Bearmax, glad to have you here. Welcome to the forum Bearmax - lots of good info on this site... plus plenty of local knowledge from the AU members. 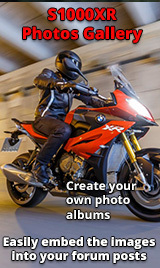 Be sure to look/join the "Australian S1000XR Owners" Facebook page. We have a ride coming up in Sydney on the 26th of August, you might want to join us, there's a few of us signed up to go.